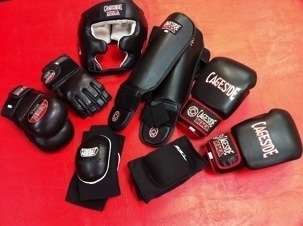 As you progress you will need Headgear, pads, MMA Style gloves. Your Gear needs to be wiped out, sprayed and air dried immediately after use. Drying Gear in front of a Fan is a good idea. Wet gear in a Gym Bag will cause Bacteria to grow! Wrestling Shoes or Bare Feet (we train on Mats). Soles must be kept CLEAN as we will all be rolling on whatever you track in. Available at Academy Sports for around $30 These Adidas have Velcro for convenience. Compression Shorts over a Jock Strap is best. Compression Shorts with built in Cup don’t stay in place well. Open Fingered Gloves are needed for more advanced training. When you are doing multiple hard rounds of Heavybag, Handwraps are a good idea. Gi Grappling is helpful to learning good fundamentals and is a part of our curriculum. Do you offer a starter kit for a beginner? Not officially but we’ll help you get what you need as you need it.